Gemini Rising gives you an adaptable personality and, in general, a wiry, flexible physique. Your airy adaptability to changing circumstances and different people is often so pronounced that your personality and even physical appearance can seem startlingly diverse to different people, and from one time to another. You say what you instinctively know others want to hear. This adaptability can extend to conscious or subconscious imitations of personality traits or the physical appearance of those you admire. 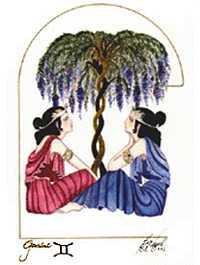 Gemini gives an intellectual orientation, or filter to your life. To others you may often appear interested, but somehow emotionally detached. Physical contacts and mannerisms are quick and restless, and sometimes those rapid movements of yours make it seem as though your mind and body are not connected. You are comfortable doing several things at once, while at the same time appearing not to be paying particular attention to any of them. Marriage can be difficult for you. For instance, you can be too ready and able to entertain yourself, while your need for more personal freedom can undermine the relationship. In any case you are subject to dual attractions and see no real reason for fidelity, nor indeed do you really expect it from others. Marriage partners, however, may require more passion and personal attention and less independence and intellectual analysis. Being ruled by Mercury, the mischievous planet of communication, makes you fond of communicating and extremely talkative. Even those with quieter natures are apt to have a great deal of intellectual curiosity. You can absorb a variety of information on all manner of subjects, which you are quite happy to share with anyone willing to listen. You give the impression of mental alertness and understanding, my dear, even though you may not be paying attention or actually know anything about the subject at hand. How deep your real intelligence goes is not determined solely by the Gemini Ascendant. Possessing a wide spectrum of orientations and abilities, you could be an excellent teacher, writer, scholar or researcher, although the flip-side of this is an inclination towards imitation, plagiarism or even being a con artist. Manually dexterous, you are not just clever with your hands but have significant artistic and design skills. Lungs and hands are the physically vulnerable areas, while respiratory illnesses and injuries to hands and fingers are common.